First off, I suggest you kiss traditional charcoal briquettes goodbye. They will work in your Egg, but natural “lump” charcoal will provide you with better results. 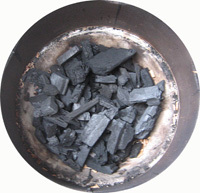 Briquettes are made of charcoal pressed together with several additives which may impart an odor or flavor inferior to that of natural pieces of wood charcoal. Briquettes, being denser, are less responsive to the air flow, so may give you less temperature control than lump charcoal. Also, briquettes produce a denser ash, and much more of it, so they require you to empty your egg more frequently, and may even interfere with air flow. Get lump charcoal, you won’t regret it. When it comes to filling you Egg with charcoal, don’t be shy! In general, you can fill it up to the top of the firebox regardless of what you are cooking and how you are cooking it. A good rule of thumb is that it’s hard to use too much charcoal, but you can use too little. When you're done cooking, just close the draft door and top damper; starved of oxygen, the coals will soon go out. Unburnt charcoal left over after your cook can simply be topped off and re-lit next time you use your Egg. 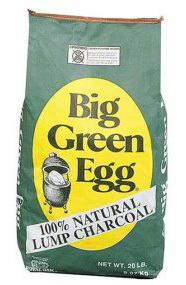 While most long-time Eggers have their favorite brand of lump charcoal, a good place to begin is with Big Green Egg brand charcoal. It is manufactured by the Royal Oak Company for Big Green Egg. 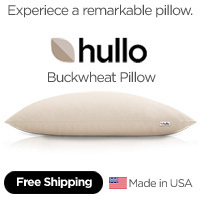 It is often available at Big Green Egg retailers. Once you get comfortable with your Egg, it is fun to begin experimenting with different charcoals and the subtle nuances of their characteristics. Without question, The Naked Whiz’s Lump Charcoal Database, is the ultimate source for lump charcoal reviews, ratings, photos and more. If you’re serious about ceramic charcoal cooking, this resource is not to be missed.